Each morning, over 700 Bronx high school students stand in line to drop off their cell phones with a man named Vernon Alcoser. The “mobile rental space” costs $1 a day. Alcoser, ever the mercurial entrepreneur, heard that two schools in the Bronx DeWitt Clinton High School and Herbert H. Lehman High School were planning to ban cell phones. 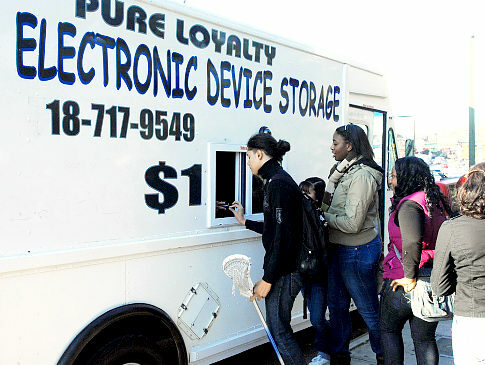 Seeing a fiscal opportunity, he decided to open up the city’s first mobile rental truck, calling his company Pure Loyalty Electronic Device Storage. As told to the New York Daily News, Tatyana James, a freshman at Herbert H. Lehman High School says, “It’s better than trying to sneak your phone in.” For several years students would hide their mobile devices during class, but this September, the schools installed metal detectors. “It makes the students and parents feel better to know their phones are safe,” said Alcoser, 38, a correction officer from the Bronx. To prevent theft, Alcoser photographs the students in the morning and gives them a ticket stub to retrieve the phone after school. It may be dangerous out there, but I love New York. Our people are so resourceful, always knowing how to make the world a better place and make a buck.